While the findings are consistent with similar studies, the organization that conducted the research is neither neutral nor independent. While this does not invalidate the survey results, skepticism toward the findings is therefore appropriate. At the same time, Panorama is consulting organization and these results are therefore self-serving, which makes the data suspect even if it is accurate. Panorama’s research is worthwhile, but would be more credible if the company engaged an independent research organization to conduct similar studies in the future. What a great discussion topic! But…what’s missing from this very incisive post? A deeper drill-down into the ongoing, chronic and ever-present root of ERP failure—a failure to adequately, quickly and robustly integrate ERP systems with other systems. We see this issue in our integration practice, and many of our partners focus on this specific area. 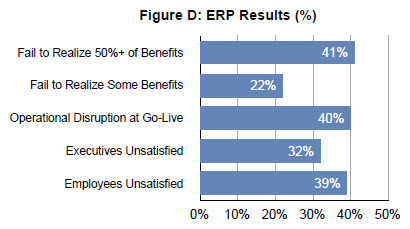 Case in point: climbing out of the integration tar-pit (http://bit.ly/bS4fC0), one firm realized an 80% reduction in maintenance time and a 20% reduction in customer on-ramp time gains in productivity from their ERP system. Yes, we are a little integration-centric, but with potential impact like this, it’s no wonder. Holly, while it is true that integration between ERP and other systems is an issue, I do not believe it is a root cause of most ERP failures. Thanks for the comment and advertisement. 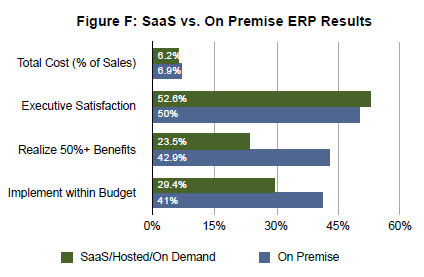 hey how saas budget varies very low with on premise budget?